The high temperature insertion type electrode is designed for periodic exposure to steam sterilization or continuous high temperature. 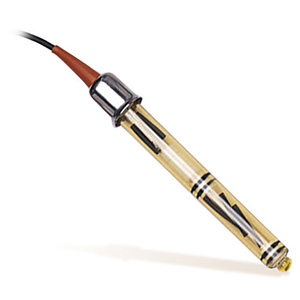 This pH electrode is housed in a durable thermoplastic (PAS) body and is rated for temperatures up to 135°C. The use of the double Porous PTFE liquid junctions with matched viscosity electrolytes provides a reference cell which permits extended periods of pH measurements in the presence of sulfides or other silver complexing agents. This electrode also incorporates pressure compensating devices to protect the electrode from extreme temperature induced pressure deviations. Ten foot cable length and BNC connector are standard. 5 each single use foil packets of pH-4, pH-7, pH-10, and de-ionized water. 참고: Comes complete with electrode care instruction sheet. For non-standard cable lengths, change the "-10" in the part number to the required length in feet, add $2 per foot to price (additional per foot cost applies to the entire length of cable. For HF/Fluoride Resistant electrode, add suffix "-HF" to the model number, add $50 to price. For 100O Platinum RTD Automatic Temperature Compensation (ATC), add suffix "-PT100" to the model number, add $50 to price. For 1000O Platinum RTD Automatic Temperature Compensation (ATC), add suffix "-PT1K" to model number, add $50 to price. For 3000O Balco, add suffix "-R3K" to model number, add $50 to price. For European PG style connector, add suffix "-PG" to the model number, add $50 to price. NOTE: PHEH-51 (1/2 MNPT) installation fitting is required for first time installation.